WATCH: Who's in? Who's Out? Msgr. Pat Brennan gets a laugh from Rev. Nathan LeRud and Rabbi Michael Cahana during an interfaith talk at Congregation Beth Israel in Portland. Three Northwest Portland faith leaders spoke in a local synagogue Feb. 9 about the tension between being welcoming communities, but still having an identity. 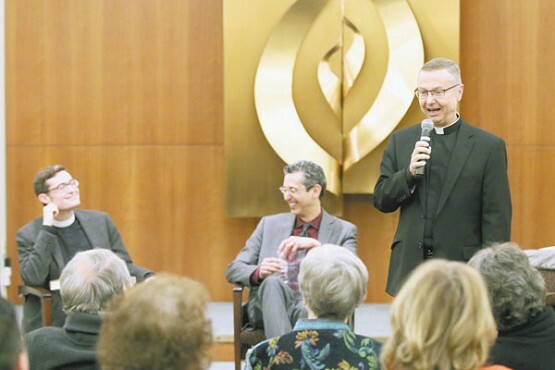 A rabbi, a Catholic monsignor and an Episcopalian priest discussed inclusion and exclusion within and among their traditions. The talks, given to an interfaith crowd of about 100, pointed out history, heresy and hypocrisy. Yes we accept you, we welcome you. Now change.’ That has been our experience,” said Rabbi Michael Cahana, explaining how Jews have been treated through much of history. The rabbi, leader of the host community, Congregation Beth Israel, recounted how in medieval Europe, Jews were welcomed into towns to carry out lending and banking, but often were expelled when loans came due. On the surface, the rabbi explained, the best time in history for the Jews was in early 20th century Germany, when they were highly included in society. That’s about the time Hitler rose to power. For thousands of years, Jews themselves have debated who is in and who is out. In recent years, the union of Reformed synagogues decided not to accept a secular humanist Jewish group. God, the rabbi said, became a boundary of membership. In many parts of Judaism, Rabbi Cahana said, women are now accepted on a more equal footing. The same goes for homosexuals. Msgr. Patrick Brennan, pastor of nearby St. Mary Cathedral, told the crowd that suspicion against Catholics came to the U.S. on the Mayflower with Puritan Protestants. During the period of immigration in the 19th century, anti-Catholicism expanded. In Oregon, a Ku Klux Klan-inspired bill would have shut down Catholic schools, had the U.S. Supreme Court not intervened. Mistrust was mutual until the Second Vatican Council. The idea that Catholics are not fully American survived into the 1960 presidential campaign, when John F. Kennedy had to convince people he was not a puppet of Rome. Discussing internal Catholic identity, Msgr. Brennan explained that women, people who are divorced and homosexuals have felt excluded from the Catholic Church. He described improvement in all three cases, citing Pope Francis’ metaphor of the church as a “field hospital” that seeks to encounter and help people before getting into theological discussions. Rev. Nathan LeRud, dean of Trinity Episcopal Cathedral, told listeners that Episcopalians have been the ones doing the excluding, since they have had an outsized role in U.S. power structures. Rev. LeRud explained that in recent years, Episcopalians have gone through a reversal, becoming the church that welcomes everyone, especially those who have felt excluded from other churches. Trinity Episcopal, in contravention to U.S. Episcopalian policy, even offers Eucharist to people who are not baptized. “We value permeable boundaries,” Rev. LeRud said. But, he added, some Episcopalians are wondering if inclusion serves as a good primary defining characteristic. Though the debate is ongoing, he thinks being inclusive might be just the way to follow Jesus, who shared a table with sinners. “Sometimes, there is great worth in stepping outside someone else’s boundaries,” he said.